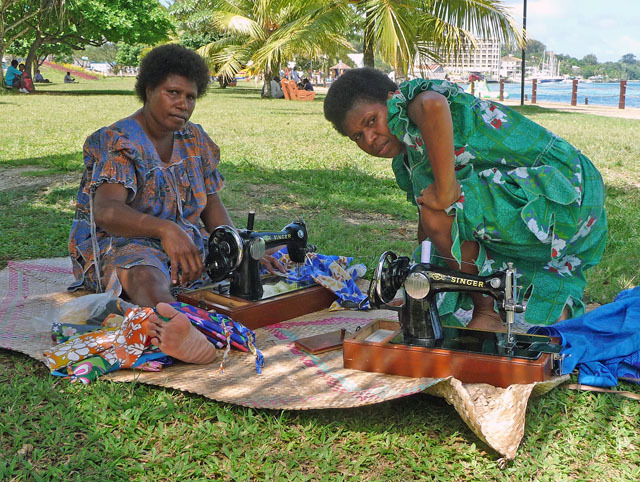 Deeper into Melanesia, culture and history. Below, on the left, is how you could view our surroundings by looking down from the northern hemisphere. 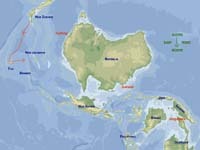 However, a map drawn like that is like a mirror, which means that left becomes right - or in this case east becomes west! Therefore, if a navigational map would ever be drawn with south pointing up, I guess it would have to look like the one to the right. Pretty weird! 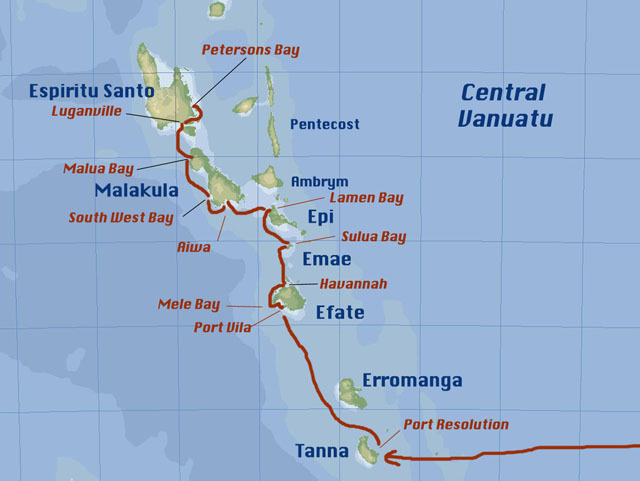 Anyway, "no worries mates" - we'll continue to use traditional maps and charts, as we did on our recent sail from Fiji to Vanuatu. 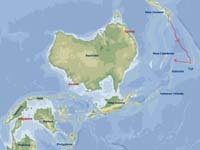 And where is Vanuatu, you may ask. Check at this LINK here, which indicates some of our routing options this year. The authorities travelled to us! John and Eric provided us with bananas. 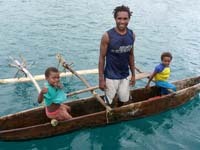 Vanuatu is our second Melanesian country - Fiji was the first. 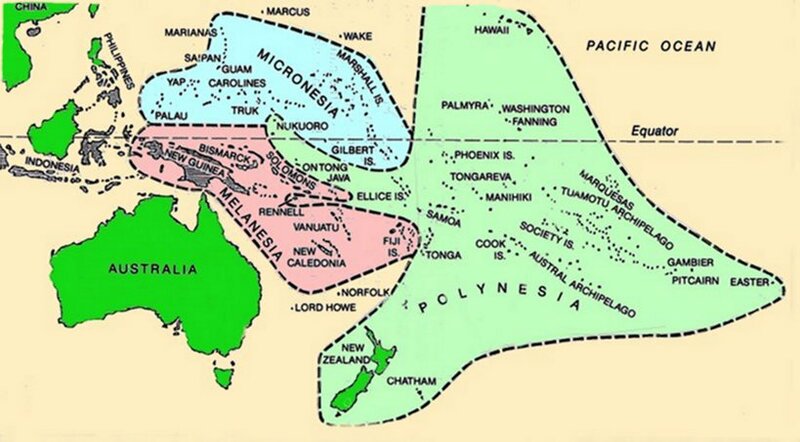 As you know, the Pacific is divided into three great cultural areas: Polynesia and Melanesia lie mostly below the Equator while Micronesia is above it. To see a map of how these areas are located, check out this LINK here. It is believed that people from South East Asia began to settle Vanuatu around 3,000 BC and only 200 years ago Vanuatu apparently supported a population of one million people. 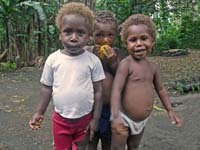 As the white man arrived the ni-Vanuatu (indigenous inhabitant) became exposed to new, deadly diseases and started to die like flies. Entire communities where wiped out and by the 1930's the population had decreased to a mere 40,000. With an increase in the availability of modern medecin and a high birth rate, the population has again grown rapidly, to 165,000 in 1990 and today here are already around 216,000 inhabitants, with half the population being less than 24 years of age. 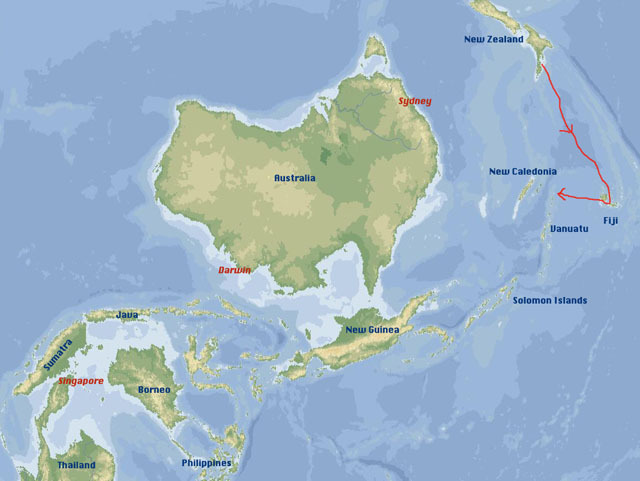 The chain of islands of today's Vanuatu was "discovered" by a number of explorers starting with Portugese navigator de Quiros, who in 1606 (sailing for Spain) visited the northern islands. 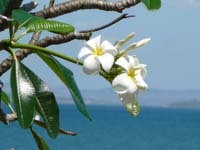 The Frenchman Bougainville arrived in 1768, also in the north which he named the Great Cyclades. 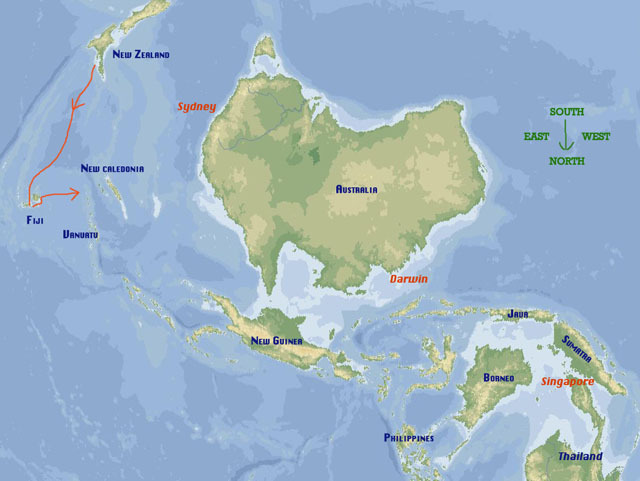 The ubiquitous traveller James Cook sailed through most of the group on his ship Resolution and named or renamed many of the islands and bays. The whole group was called the New Hebrides since that. 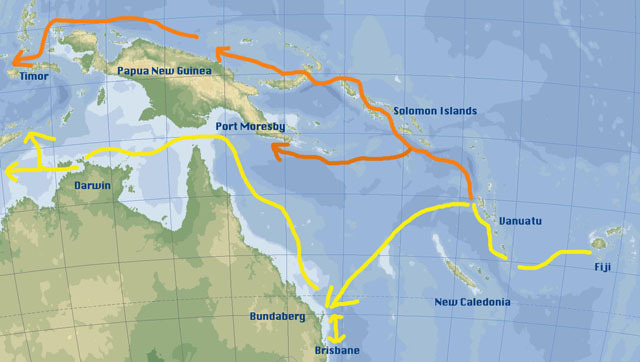 An other celebrity, Captain Bligh sailed through in 1789 in his amazing open longboat voyage from Tonga to Timor after the Bounty mutiny. European settlers began to arrive in the 1850's - both French and English. 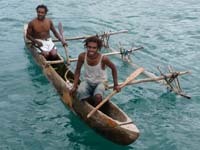 The French had earlier colonized the western neighbour New Caledonia and The Brits had taken rule in Fiji to the east. The stage was set for a confrontation between the two European powers, with no consideration for the native population. In 1914 the area was declared a region of joint interest and a condominium government was born. 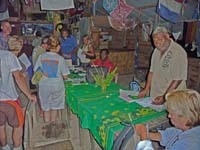 This lead to duplication of authority and much confusion for the indigenous people, who were officially stateless. 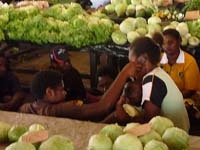 There were just about two of everything; not only laws, police forces and prisons, government offices, but also weights, measurements and currencies. Thankfully there were not a lot of motor vehicles, as I guess the French drove on the right and the English on the left! Foreign nationals, not travelling on British or French passports had to choose which authority they would follow the rules of! 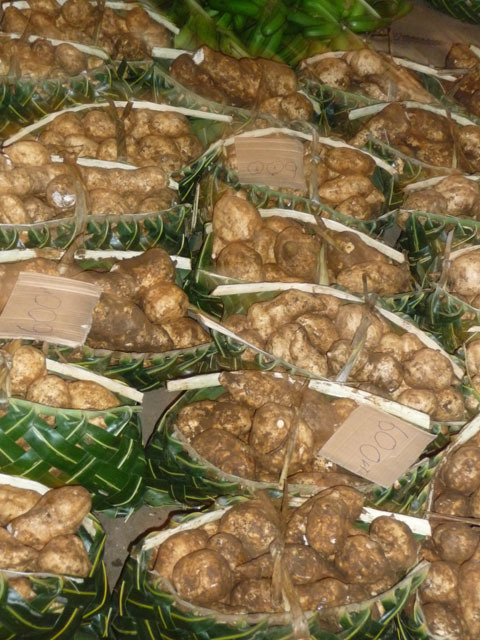 Caos reigned in the New Hebrides to the detriment of the native people. 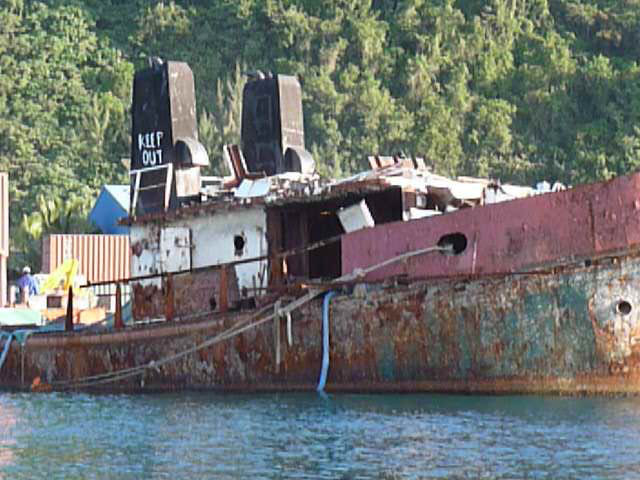 WW II had a big impact on the New Hebrides. 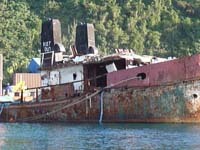 Japan had invaded the Solomon Islands by 1942, and later that year over 100,000 US troops were sent to Luganville on Espiritu Santo. Over 500,000 Allied troops would pass through the islands during the war. 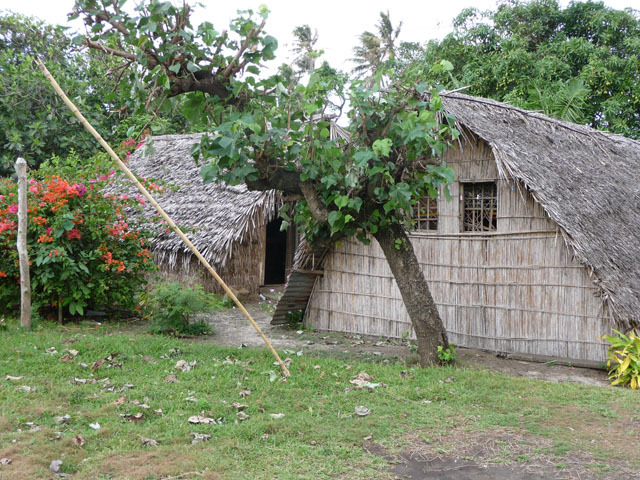 Many islanders went to work for the Allied forces, the affect of which is still seen today. 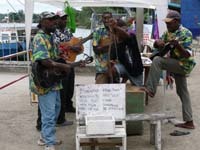 The country achieved independence in 1980 and the new nation adopted the name Vanuatu (meaning Eternal Land). 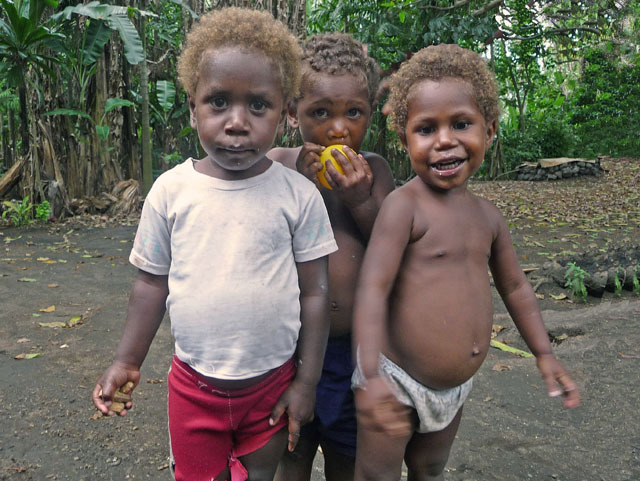 The indigenous people possess an astounding variety of cultures, from the land-diving tribesmen (models for today's bungy jumpers) of Pentecost island in the north to the festival-rich residents of volcanic Tanna in the south. It would be difficult to find a country of greater contrasts. 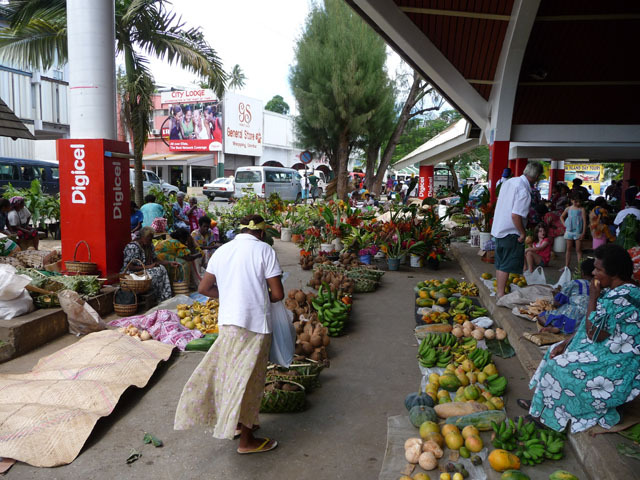 The glamorous shops of cosmopolitan capital Port Vila are dramatically different from the unchanging, traditional villages on the outer islands. Away from the commercial tourist resorts Vanuatu is still a land of adventure. With around 110 languages, most having several dialects, Vanuatu has the world's highest density of languages per capita. 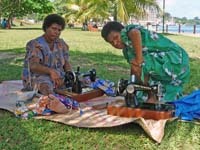 Many ni-Vanuatu speak several languages: at least one local language, French or English and Bislama. 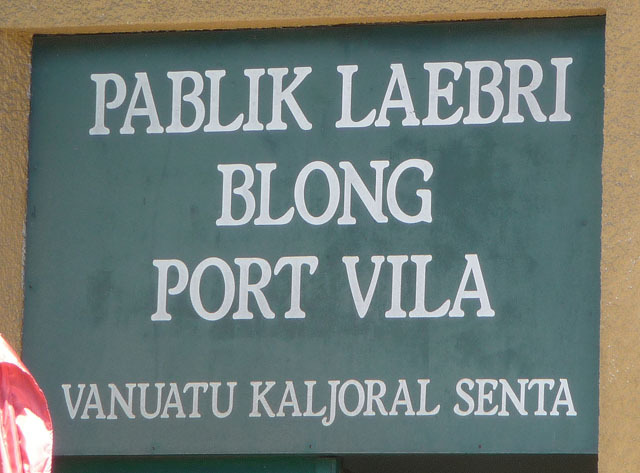 English and French are official languages but Bislama is the national language, spoken by more than half of the population. This dialect of Pidgin English is a useful communication medium between persons from different language groups. Back to our own trip. 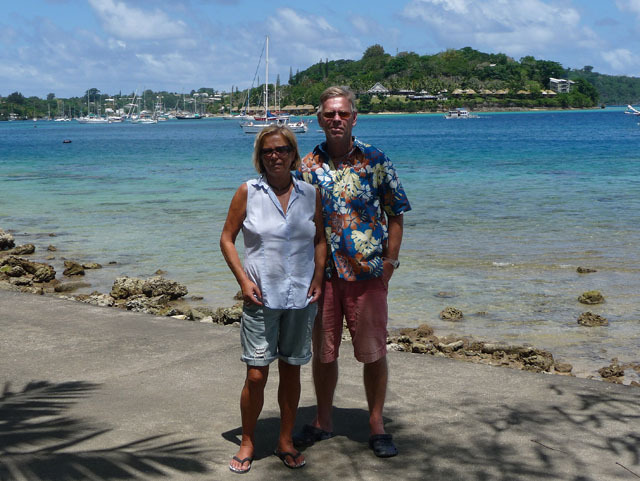 We had a very comfortable sail from Lautoka in Fiji to the island of Tanna in the southern part of Vanuatu, where we anchored in Port Resolution, the bay named after James Cook's ship during his visit more than 200 years ago. Our visit happened to coincide with a rallye of 13 yachts arriving from New Caledonia. 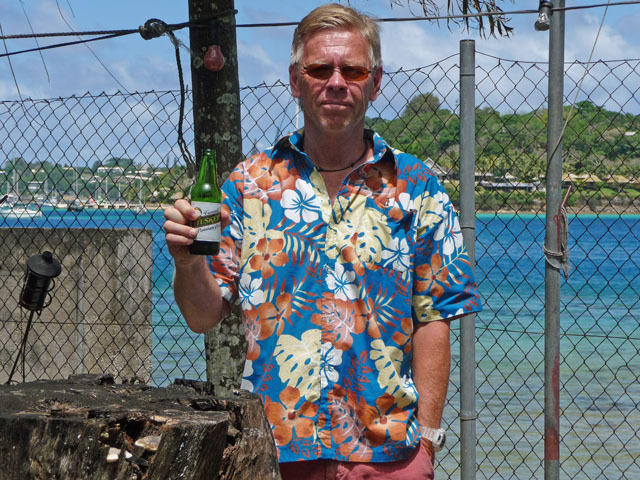 On the positive side this ment that we didn't have to take a two hours truck ride accross the mountains to Lenakel on the other side of the island to check in. Instead, the rallye organizers had arranged for the authorities (customs, immigration and health) to travel to Port Resolution, where all clearance formalities where taken care of. 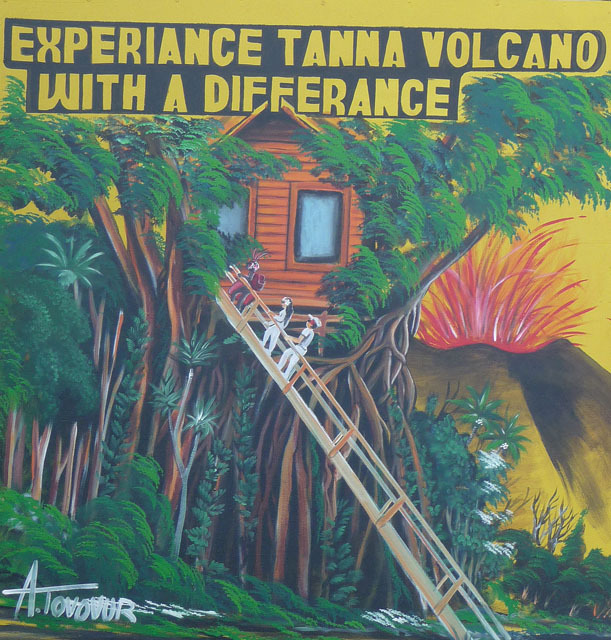 The main attraction of Tanna is the volcano Yasur, which is said to be the most accessible active volcano in the world. You can stand on the rim of the crater and look down into it while the action is on! 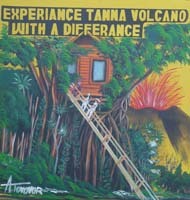 The image above (left) shows an artists impression of Yasur. 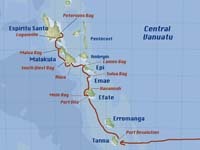 A week later we had an over-night sail of 130 nautical miles, to the capital Port Vila on Efate island. This time the trip was not comfortable at all - no wind and confused seas meant motoring in washing machine movement for 24 hours! 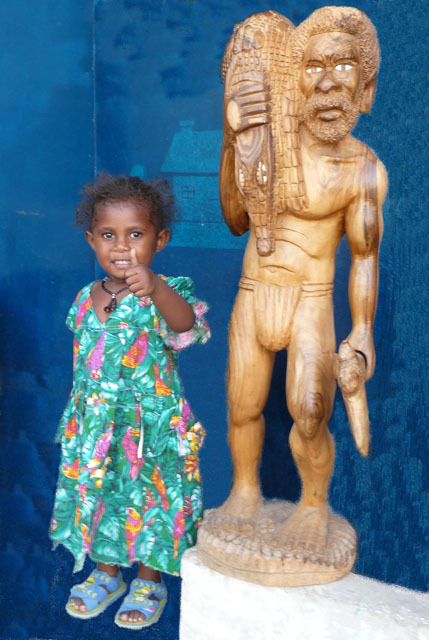 Girl with crocodile hunter carving. Port Vila is many worlds apart from Tanna, where we didn't see any houses built from other material than sticks and straws (except the school). The capital is an attractive and quite modern city with excellent facilities. It is surprisingly sofisticated compared to the much larger towns of Fiji, such as Lautoka. 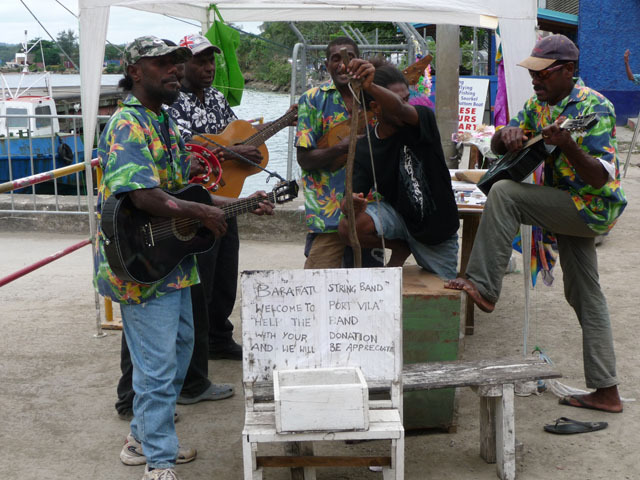 Local band entertaining cruise ship tourists. Is the "keep out" sign really necessary? 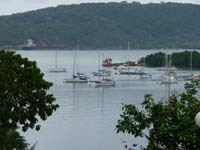 provides the English broadcast in Port Vila. 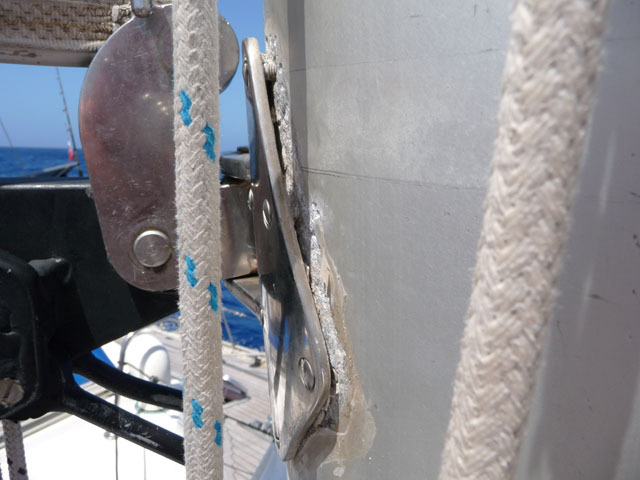 Corrosion problem required final decision on route. Se separate story at link below. In Port Vila we had to make the big decision to sail to Australia instead of heading up to Solomon Islands, PNG and Indonesia. The reason was that we had a bad case of corrosion between the main mast and boom and the fitting holding them together. I decided to have this repaired in Australia and just make a temporary fix until that. 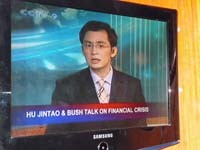 See separate story at this LINK. I will end this report here, rather abruptly, because I need to get it uploaded to our server from the internet café at the local yacht club before we depart. 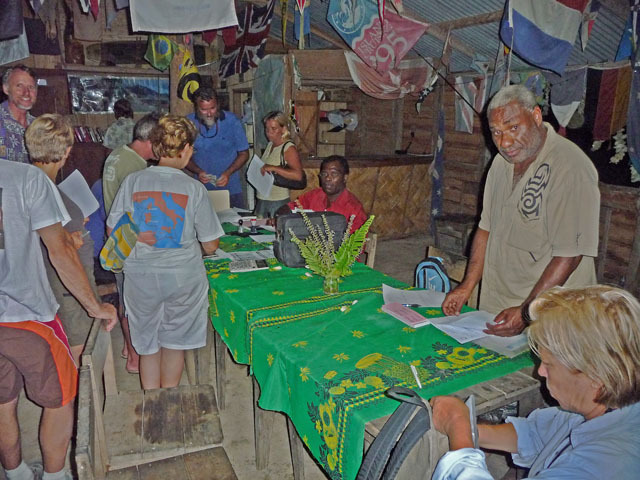 There will definately be an additional report from Vanuatu soon. See you later.